Nader Tehrani will present his work with NADAAA in a public lecture with an introduction by Anthony Vidler and moderated by Florian Idenburg. 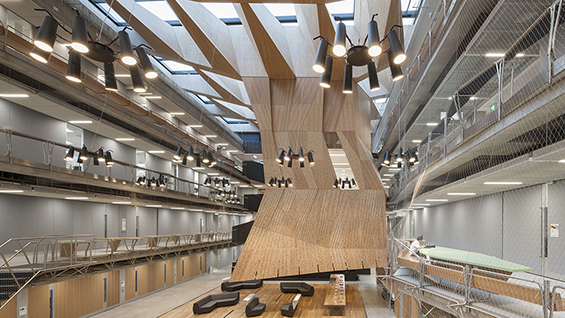 NADAAA collaborated with John Wardle Architects (JWA) of Melbourne, Australia on the Melbourne School of Design at the University of Melbourne, which was completed in 2015. Central to the project is the Studio Hall, enclosed by a coffered timber roof that mediates natural daylight and assists natural ventilation. In Atlanta, NADAAA worked with Lord Aeck Sargent Architecture on the Hinman Research Center on Georgia Tech’s campus. The architects transformed the 35,000 square-foot interior of a 1939 building to include research labs and a collection of design studios suspended on a platform tray from the building’s original crane gantry. Opening in 2017, the firm’s renovation and expansion project for the University of Toronto John H. Daniels Faculty of Architecture, Landscape, and Design incorporates interconnected graduate and undergraduate design studios in a 19th-century Gothic Revival building while uncovering and restoring its prominent staircase, masonry, and arched hallways. All schools of architecture and design, they also give form to varied schools of thought. Tehrani is the current Dean of the Irwin S. Chanin School of Architecture of The Cooper Union. He joined Cooper from the Massachusetts Institute of Technology (MIT), where he was professor of architecture and served as head of the Department of Architecture from 2010 to 2014. For over 25 years, he worked to motivate academic research to change practice and to test new protocols of practice in the context of academia. His own research targeted material culture as the basis for speculation—exploring material properties, negotiating materials and their geometric predispositions and challenging the means and methods of building processes. Working between the digital realm and the medium of full-scale mock-ups, he seeks to simulate and test alternative approaches towards tectonic studies. You may watch a recording of the lecture on The Irwin S. Chanin School of Architecture Channel.